I’m very lucky and fortunate living in Finland. 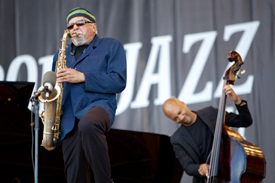 It has some fantastic jazz musicians, and an amazing variety of jazz festivals in any one year. The one that started it all off way back in 1966 was the Pori Jazz Festival. It is without doubt, the oldest jazz festival in Europe. Back then it was a two day event held over the weekend in mid July, and attracted around 1300 people. Fast forward to last years 2011 event and the numbers are extraordinary, selling 57,000 tickets, over the course of a whole week. In addition, 95,000 were people attending free of charge events. In total a 150,000 people enjoyed listening to jazz, at 117 concerts, held at 11 venues. 2011 was a mixed bag in our view but the festival has evolved into not just being a jazz festival, but a festival of contemporary music with lashings of jazz sprinkled all over Pori. Performances by pop icons Elton John and Ricky Martin doesn’t really swing with us so we’ll allow it, but with the legendary and ground breaking sounds of Charles Lloyd and his quartet billing onto the stage, Jo Stance, the Robert Glasper Experiment, together with home grown sax fiend Joonatan Rautio and his trio, the Timo Lassy Band and the Olli Hirvonen Quartet, this is through and through one of the biggest jazz festivals in Europe. One we don’t want to miss. The event is also host to the Pori Jazz for Kids festival. A tandem event running alongside the main feature from 14th – 18th. The five day long family event offers dozens of musical workshops, concerts and performances on three different stages. Last years event catered for over 25,000 people, with 2000 children performing under supervision from musicians and professional tutors. This year is going to be bigger and better no doubt. Headlining is the elegant, soulful and sultry notes of Norah Jones, her first ever performance in Finland. We’ll be updating the program listings here as and when they are available so stay tuned. Festivals like this are epic in stature and only get better through its’ maturity. In it’s 47th year now, we can only guess at the extravaganza to be set for it’s fiftieth anniversary. We’ll be doing a fuller review of the event this year. Roll on the Summer season. The venue is held at multiple venues and within walking distance of each other. During the festival the Pori Jazz ticket office is in the Satakunta Museum, Hallituskatu 11 (please note: access also on the other side of the building from the Jazz Street, Eteläranta 12). Open daily July 4th – 7th from 10 am to 5 pm, 8th – 16th from 10 am to 10 pm and 17th from 10 am to 5 pm. Tickets are also available at the venues on Doors open times. The show times of the concerts are approximate. The time indicates the doors open time, but the actual concert might end earlier. The following concert venues will require a minimum age of 18: LP47!, Kulttuuritehdas Kehräämö, Klubi - Klubben, Klubi - Klubben Garden, Cafe Jazz, Apollo Stage after 10 pm. Children under 12 are allowed to Kirjurinluoto Arena with the tickets of their parents. To the indoor venues children require a ticket of their own if they need a seat. After 10 pm children are not allowed to concert venues with age limit of 18.